Tactically inspired, the Instant utilizes Gerber's F.A.S.T.™ mechanism for easy, one-handed blade opening. 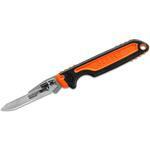 The thumb plunge unlocks the over-three-inch blade for safe closure. Layers of G-10 composite are textured and shaped to make an ultra-light, ultratactile handle. It's a sleek clip folder made for everyday use. This is the second of this knife that I have owned. Lost the other in the woods. Easy, quick open... stays sharp, perfect size. 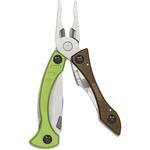 It is lightweight but still heavy enough to cut the toughest of branches when I am in the tree stand. I had the previous one for years and it never got loose. Perfect job by Gerber. I was looking for a good pocket all purpose work knife, I have a cheap one and wish I could up load the comparison video I took. The cheap one snaps open with slight finger pressure. This instant takes two hands to open and then only goes part way. I offered it to my son and he tossed it back with a laugh. It's nicely made, looks good and is comfortable to hold, the looking button is convenient and makes closing one handed a snap but I would rather it open one handed with a snap. General use and fishing. Good quality blade and overall, but very difficult to open with one hand. Still need to use 2 hands to open which defeats the purpose of the assisted open. Was told to give it time. Tried to slightly loosen the screw on the side but it would. It budge. I am hoping this will improve with continued use. Also, the pocket clip is too tight, so it is hard to use. Hey, I wanted to share "Gerber 31-002184 Instant Assisted 3.33 inch Black Combo Blade, G10 Handles" with you from KnifeCenter.